If you are visiting San Diego, California for the first time looking to explore the place or a resident or regular visitor wishing to delve deeper into the city’s history, San Diego’s Cabrillo National Monument and Point Loma are must-see places for you. This national park covers 160 acres of protected land bordered by the Pacific Ocean in the west, San Diego Bay in the east and residential neighbourhoods up north. The vast space is full of rich natural resources and amazing views as well as historical and picturesque landmarks that are sure to give you a much deeper appreciation of San Diego. 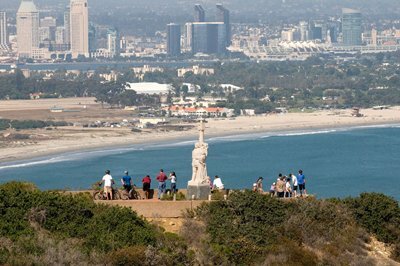 Named after Juan Rodriguez Cabrillo who was the first European to reach the west coast of the United States, the Cabrillo National Monument is home to the famed explorer’s statue sitting high above Point Loma amidst spectacular views of the Pacific Ocean and San Diego Bay. The monument is undoubtedly the national park’s main feature and is a perfect place for solitude as well as for watching ships and boats enter and leave the harbour situated below. Though Cabrillo’s statue is the main attraction, the park also has a lot of cultural and natural resources to offer. Popular park activities include photographing and viewing the city from atop the hill, hiking, enjoying Point Loma’s tide pools, and visiting the Old Point Loma Lighthouse. Because of its hilltop location and the presence of the Pacific Ocean the climate is generally sunny and mild all the year round making perfect for a good hike along the Bayside trail leading straight to the tide pools, which are the largest in San Diego. With its perfect mix of culture, history, and fun activities, Cabrillo National Monument and Point Loma are definitely great places to visit whether you are new to San Diego or not.